The Component Library can be found by navigating to the Components tab. It displays a list of all components that you have downloaded from the ComStore or created yourself, and a list of all your component groups. In the left navigation pane, the Component Library is grouped into Component categories, and it also shows iOS Mobile Apps downloaded from the App Store section of the ComStore. To learn more about the Mobile Apps category, refer to Download iOS apps. By default, the Component List in the right navigation pane displays all the components in the Component Library. You can filter the list by clicking on one of the component categories or component groups in the left navigation pane. Actions • Add component(s) to group - Refer to Add or remove components to or from a group. • Schedule a job - Select any components of the categories Applicationsand Scripts, and click Schedule a job. Refer to Job scheduler. • Refresh - Refreshes the current view. Show entries Lets you select to show 10 / 25 / 50 / 100 entries per page. Search A dynamic search field. As you type, the search results are narrowed to match your search string. Check box Select any of the components to add them to a component group. Refer to Add or remove components to or from a group. Icon Icon that identifies the component. Name The name of the component. Description The description of the component. Hover over the description to see additional information. Component Level Determines which users can access this component. Users with Components > Manage security level can edit the Component Level value from the Component list page by clicking the linked number in the Component Level column and selecting a new Component Level from the drop-down list. Refer to Security levels. Component levels go from 1 (Basic) to 5 (Super). To learn how to configure which components a user can see, refer to Add a user. Files The number of files that are part of this component. Size The size of the component. Favorite Makes the component available to be used in quick jobs and as alert response in monitors. Only available for the categories Applications and Scripts. Refer to Make a component available for quick jobs and the Response Details section in Create a monitor. Toggle User Task Makes the component available to all end users with the Agent installed on their computer. Only available for the categories Applications and Scripts. Refer to User Tasks. Export Component This is the first step when you download a component. The gray icon indicates that the component is available on the Web Portal, but is not yet ready to download. The yellow icon indicates that the component is being prepared for downloading, that is, packaged as a .cpt file (a proprietary type of .zip file that includes an XML file and possibly additional files such as a batch file or image file that can be recognized as a Datto RMM file type when it is imported into another web portal). 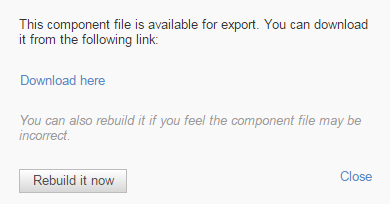 Refer to Export a component. Download Component Once the file has been zipped up, the icon turns blue. When you click on the icon, the component gets downloaded to your workstation. Copy this component Opens the Component page. All fields are exact copies of the original, except the Name, which is labeled as "Copy of...". Make any required changes and click Save. Delete component Will delete the component from the Component List. If the component is part of an active job, you will receive a warning. Click OK or Cancel. Refer to Create a component. Components that appear on the Component list can be downloaded to your workstation and deployed to remote devices. If you see a gray Export component icon, the component has either not yet been downloaded, or was changed and must be rebuilt. "Export" and "download" are used interchangeably. Click on the gray Export component icon . A dialog box appears. A note appears at the top of the page that the component is being built, and the icon turns yellow . The .zip file that is generated will have a .cpt extension. When the build is complete, the icon will turn blue. Click the blue Download component icon . Another dialog box opens that includes a download link. Click Download here to download the component. If you have previously downloaded the file and think it might have been changed, click Rebuild it now. You will be prompted to open or save the file. Note that the file extension might now be .zip. In the top left corner, click Import Component. Click Choose file... and locate the component file you want to upload. Only Datto RMM Component files (*.cpt) can be imported. When the upload is complete, the Component page will open. Modify the component as required. Refer to Create a component. The Community ComStore is a repository for Datto RMM components, policies, and scripts. All Datto RMM users are encouraged to share best practices with the Community so that all users can benefit. Make sure you are familiar with the Community ComStore ground rules before using the site. Components shared in the Community ComStore are only supported by the Community. By default, components are grouped into categories. Refer to Component categories. You can, however, create component groups, and associate components with them, based on your own criteria. This is helpful if you have components that are frequently viewed or edited. Navigate to the Components tab. On the left, under Component Groups, click the plus sign. A pop-up window will open. Components of the categories Applications and Scripts can be added to component groups. You can do it in two places: on the Component List page and within a component group. On the Component List, check the component(s) you want to add or remove. Click the Add component(s) to group icon in the Action row. A pop-up window will allow you to select a group. If you select No group, the selected component(s) will be removed from all groups they are a member of. In the component group, check the component(s) you want to add or remove. Select a group to move the selected component(s) from the current group to the selected one. If you select No group, the selected component(s) will be removed from the current group. Components that can be edited (i.e. custom components and copies of components downloaded from the ComStore) can be made available to some sites but not others. This is known as component site mapping. Component site mapping only works for Quick Jobs and User Tasks. Click on the component name you want to edit. Scroll to the Sites section and click Selected sites. Select the sites you wish to make the component available to and then click Include. Use the Search field above either the Include or Exclude column to search for your sites. As you type, the search results are narrowed to match your search string. Use Shift or Ctrl on your keyboard to select multiple sites. Once the changes are complete, click Save. After you have mapped components to a specific site, it makes sense to specify a local cache or caches to store the components. Refer to Designate a local cache.